House Transportation and Infrastructure Committee Chairman Bill Shuster (R-PA) recently introduced a discussion draft of legislation to improve the finances of the Highway Trust Fund by raising the gas tax, enacting other taxes and fees, and setting the stage for a new form of financing to replace the gas tax over the long term. Without commenting on the entirety of the legislation, the financing proposals are a welcome addition to the conversation over infrastructure financing. Under current law, the HTF will run out of reserves by 2021 and faces a cumulative shortfall of about $160 billion over a decade. While the trust fund is largely funded by an 18.3-cent-per-gallon gas tax (and 24.3-cent-per-gallon diesel tax), recent general revenue transfers have kept the trust fund afloat without dealing with the structural imbalance between spending and revenue. That structural imbalance will grow over time, as highway spending continues to grow at about the rate of inflation while the gas tax has been frozen in nominal dollars since 1993. Chairman Shuster's draft offers a three-part plan to make the HTF solvent. First, it would raise and index the current gas tax. Second, it would impose several new taxes and fees. And third, it would require the gas tax to be replaced with a new financing source after 2028. Taken together, the Joint Committee on Taxation estimates that the new taxes will result in $287 billion of gross revenue offset by $63 billion in less general revenue from 2019 to 2028 – a net increase of $224 billion that would assure HTF solvency over that period and result in $96 billion in additional revenue over current law outlays. The legislation would increase the gasoline and diesel taxes by 15 cents and 20 cents per gallon to 33.3 cents and 44.3 cents, respectively, phased in over three years. As a result, the gas tax would be similar in size as if it had been indexed to inflation back in 1993. After this one-time increase, the bill would index the gas and diesel taxes to inflation – so they would reach an estimated 39.3 cents and 52.3 cents, respectively, by 2028. To account for the fact that some highway and transit users don't pay the gas tax, Shuster's proposal diversifies the revenue sources coming into the HTF. Specifically, the draft would establish a 10 percent tax on bicycle tires and a 10 percent tax on electric vehicle batteries as a starting point for capturing user fees from non-gas vehicles. Source: Joint Committee on Taxation. Note: gross revenue raised by these provisions would total $287 billion over a decade, but it is offset by $63 billion in less general revenue largely due to income tax effects. The Shuster proposal also recognizes the decreasing role gasoline is likely to play in powering cars in the future. The plan thus calls for ending fuel taxes in 2028 and replacing them with a new source of revenue. While it does not identify the specific financing mechanism, it creates a 15-member commission, appointed by officials from both the legislative and executive branches but limited to non-members of Congress, to recommend a proposal to replace the gas tax and ensure the long-term solvency of the Highway Trust Fund. The commission's recommendations would be given expedited treatment and moved directly to the floor of the House and Senate for a simple up-or-down vote. In addition, the proposal establishes a voluntary pilot program on determining how feasible it would be to replace the gas tax with a per-mile user fee (often called a Vehicle Miles Traveled tax, or VMT). A few years ago, we estimated a VMT of less than 2 cents per mile would be sufficient to replace the gas tax and make the HTF solvent. We also offered a number of other options, ranging from an oil tax to a tire tax to a driver's license fee. Solutions could also raise some of the existing non-gas taxes under current law and/or reduce low-priority highway spending. Others have recently offered the idea of implementing a carbon tax as a way of both increasing revenue and helping combat climate change. 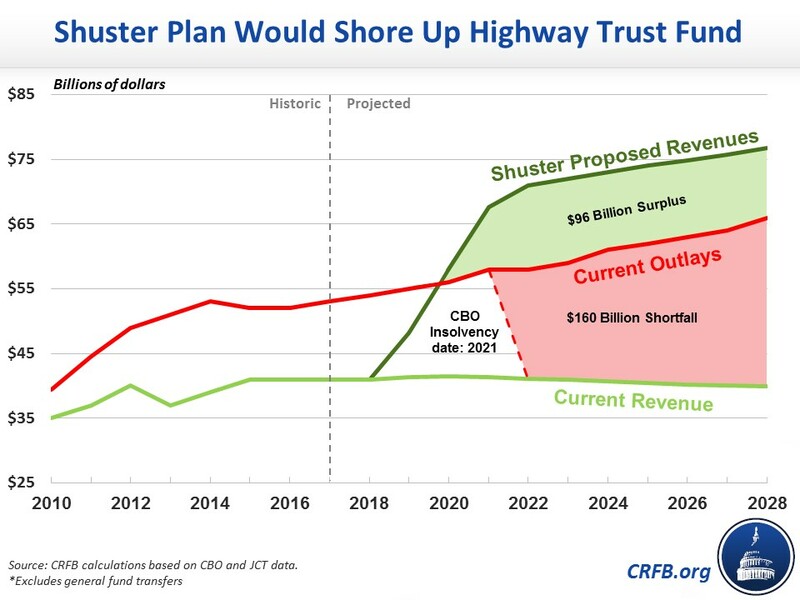 As we've explained before, policymakers must enact a structural fix to make the Highway Trust Fund solvent. We’ve previously proposed our own solutions, but Chairman Shuster's are in some ways better and bolder. We're happy to see such solutions being put on the table.